Sheaffer Targa 1002 fountain pen from 1989-98. Matte black finish with chrome plated trim and the later chrome plated cap derby. Medium steel nib. Excellent condition. Product Name Targa 1002 Matte Black. This is the later version with the shiny chrome plated derby instead of the original matte black derby. Manufacturer and Year Sheaffer, USA -- 1989-98. Filling System Takes Sheaffer-style cartridges and converters. A Sheaffer piston converter is installed. Color Matte black with chrome plated trim. The trim includes chrome plated end pieces. Nib MEDIUM stainless steel nib. You can see the "M" on the section just above the clutch band. Smooth with nice tipping material. Condition Excellent condition. The trim looks perfect, as does the cap. 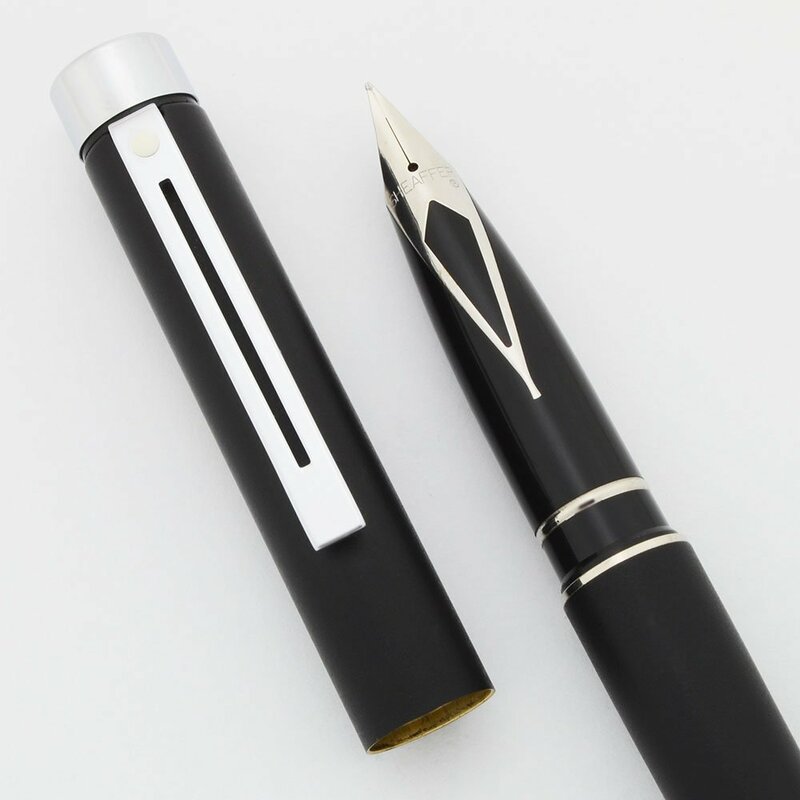 The pen has posting marks that marginally affect the finish, making it a little shiny. No scratches. The pen is working well.